Culver City, CA (April 16, 2014) – Action, romance and the most famous volcanic event in recorded history collide in the epic adventurePOMPEII, available May 20 on Blu-ray 3D™, Blu-ray™, DVD* and Digital from Sony Pictures Home Entertainment. 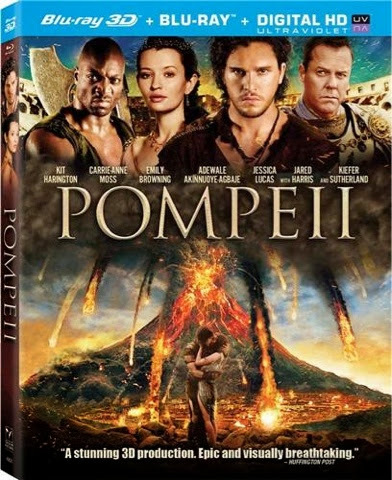 Kit Harington (TV’s “Game of Thrones”), Emily Browning (Sucker Punch), and Kiefer Sutherland (TV’s “24”) star in this heroic tale of a young slave-turned-gladiator in a race against time to save his true love during the cataclysmic eruption of Italy’s deadly volcano, Mount Vesuvius. The POMPEII Blu-ray 3D, Blu-ray and DVD each feature hours of bonus features, including commentary with filmmakers, and two making-of featurettes: “The Assembly – Cast and Characters” and “The Volcanic Eruption – Special Effects.” The Blu-ray 3D and Blu-ray exclusively feature deleted and alternate scenes, plus four additional making-of featurettes focusing on the stunts, production design and costume design in the film, along with a behind-the-scenes look at ancient history’s greatest disaster. POMPEII is directed by Paul W.S. Anderson (Resident Evil: Retribution, The Three Musketeers). Carrie-Anne Moss (The Matrixseries), Adewale Akinnuoye-Agbaje (Thor: The Dark World), Jessica Lucas (Evil Dead), and Jared Harris (TV’s “Mad Men”) co-star in the film. Synopsis: Set in 79 A.D., POMPEII tells the epic story of Milo (Harington), a slave turned invincible gladiator who finds himself in a race against time to save his true love Cassia (Browning), the beautiful daughter of a wealthy merchant who has been unwillingly betrothed to a corrupt Roman Senator (Sutherland). As Mount Vesuvius erupts in a torrent of blazing lava, Milo must fight his way out of the arena in order to save his beloved as the once magnificent Pompeii crumbles around him. POMPEII is a Constantin Film Internationaland Impact Pictures (Pompeii) production. It was written by Janet Scott Batchler & Lee Batchler (Batman Forever) and Michael Robert Johnson (Sherlock Holmes) and produced by Paul W.S. Anderson, Jeremy Bolt (Resident Evilfranchise), Robert Kulzer (The Mortal Instruments: City of Bones), and Don Carmody (The Mortal Instruments: City of Bones). Executive producers are Martin Moszkowicz, Peter Schlessel and Jon Brown. It has a run time of approximately 98 minutes and is rated PG-13 for intense battle sequences, disaster-related action and brief sexual content.